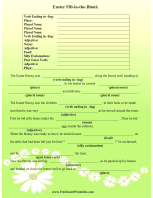 A printable letter from the Easter Bunny intended to be left out for a child to find, perhaps in a basket or near half-eaten carrots, on Easter morning. Happy Easter! I had so much fun hiding the eggs around your house. Do you think you'll find them all? You're so clever, I bet you will! I'm sorry you didn't get to see me, but I make my deliveries very early in the morning. 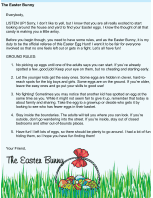 Also, the Easter Bunny Rules say that kids aren't allowed to watch me. I hope you like your Easter basket. I filled it full of candy and little toys especially for you. It's so fun to pick out things for good little boys and girls! Please have a wonderful Easter Sunday with your family. 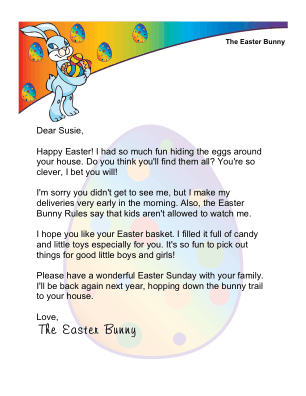 I'll be back again next year, hopping down the bunny trail to your house.